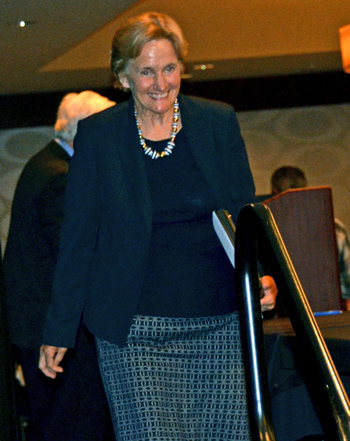 Catherine Vogelweid was the winner of the Zoetis Distinguished Veterinary Teacher Award. More than $300,000 was awarded May 9 during the MU College of Veterinary Medicine’s 2017 Honors Banquet, held at the Courtyard by Marriott in Columbia, Missouri. The event featured the presentation of more than 70 awards for scholastic achievement, clinical proficiency, community service and leadership. Awards were also presented in memory of former students and beloved pets. Veterinary medical students shared the spotlight with faculty members, house officers and staff. Two new teaching awards were presented for online instruction. The Harrison-Kaplan Online Graduate Teaching Award was presented to Small Animal Emergency and Critical Care Teaching Professor Marie Kerl, DVM, MPH, for excellence in online graduate student engagement, course development and course management and delivery. The Harrison-Kaplan Online Undergraduate Teaching Award was presented to Technician Stephanie Gilliam, RVT, VTS, BS, for excellence in online undergraduate student engagement, course development and course management and delivery. Dennis O’Brien (left) received the Dadd Award from CVM Dean Neil C. Olson (center) and last year’s recipient, Fred Williams III. Students in each academic class selected an outstanding teacher to receive 2017 Golden Aesculapius Teaching Awards. Winners were Cathy Kovarik, DVM, PhD, associate teaching professor of veterinary neuroscience and large animal gross anatomy, honored by the Class of 2020; Fred Williams III, DVM, assistant clinical professor of pathology, honored by the Class of 2019; Scott Poock, DVM, associate extension professor, honored by the Class of 2018; and Dusty Nagy, DVM, PhD, associate teaching professor in food animal medicine and surgery, who was chosen by the graduating Class of 2017. 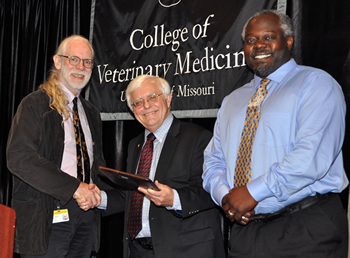 Williams was honored with a second teaching award when he was presented the Student Chapter of the American Veterinary Medical Association (SCAVMA) Teaching Award for Basic Sciences. 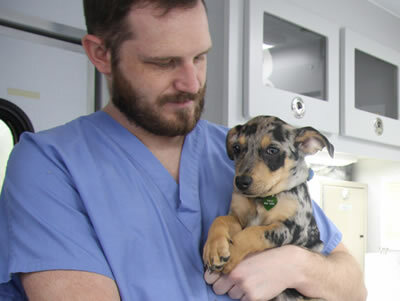 The recipient is chosen by first- and second-year veterinary students for immense contributions to the students’ education and progression through the veterinary curriculum. The SCAVMA Teaching Award for Clinical Sciences, chosen by the third- and fourth-year classes, was presented to Alison LaCarrubba DVM, an assistant teaching professor in equine medicine. The award is based on dedication to student education, progression toward clinical competency and development of professional abilities. Elizabeth Bryda accepted the Zoetis Award for Veterinary Research Excellence from CVM Dean Neil C. Olson, last year’s recipient Jeffrey Bryan, DVM, PhD, and Tom Kent of Zoetis. The senior class also honored a veterinary technician who had an impact on their clinical experience. Alyssa Doner, RVT, a technician in the Small Animal Surgery Service, received this year’s honor. 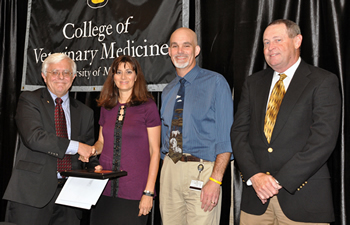 The Dadd Award honors excellence in veterinary medicine teaching as judged by peers. The 2017 recipient was Dennis O’Brien, DVM, PhD, professor and Chancellor’s Chair of Excellence in Neurology. Faculty members also nominate the recipient of the Zoetis Award for Veterinary Research Excellence, which is presented to a faculty member or graduate student whose research related to veterinary medicine has promise of national recognition. This year’s winner was Elizabeth Bryda, PhD, a professor in the Department of Veterinary Pathobiology and the director of the Rat Resource and Resource Center and the MU Animal Modeling Core. Each year members of the student body select an outstanding teacher who, through ability, dedication, character and leadership, contributes to the advancement of the profession as the recipient of the Zoetis Distinguished Veterinary Teacher Award. The Class of 2017 selected Catherine Vogelweid, DVM PhD, clinical professor of veterinary pathology and emergency and disaster response to receive the award. A number of awards were presented to students prior to the Honors Banquet. A complete list of awards and recipients can be found here.